Coffee, Do Me a Favor (Hangul: 커피야, 부탁해; RR: Keopiya, Bootakhae; lit. 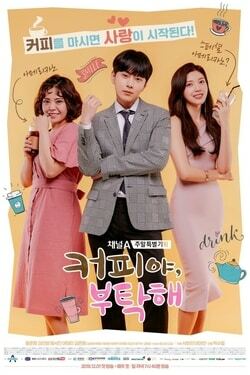 Coffee, Please) is a 2018 South Korean television series starring Yong Jun-hyung, Kim Min-young and Chae Seo-jin. It premiered on December 1, 2018 and airs on Channel A's Saturdays and Sundays at 19:40 KST time slot. It tells the story of an overweight woman who, after sipping on a cup of magic coffee, becomes a beauty; and a handsome man who doesn’t believe in love. A webtoon writer who doesn't believe in love. Hyun-woo's assistant / trainee who has a crush on him. A beautiful woman whom Seul-bi transformed into after drinking a magic coffee. ^ [MV] High.D(하이디)(SOONAMOO(소나무)) _ Beautiful Girl(예뻐보여) (Coffee, Do Me a Favor(커피야 부탁해) OST Part.2). YouTube (in Korean). 1theK. Retrieved December 30, 2018. ^ "Yong Junhyung's Upcoming Romantic Comedy Confirms Details". Soompi. November 15, 2018. ^ "[공식입장] 용준형X김민영X채서진, '커피야 부탁해' 캐스팅..촬영시작". Osen (in Korean). 1 June 2018. ^ "Highlight's Yong Jun-hyung returns to small screen". Kpop Herald. November 29, 2018. ^ "Lee Tae-ri to Star in "Coffee, Do Me a Favor"". Hancinema. June 19, 2018. This page was last edited on 14 January 2019, at 08:52 (UTC).